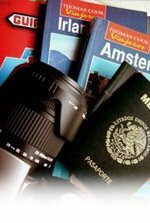 If traveling to another country, find out about their laws, customs, etc. Carry your money and personal documents (license, passport, credit cards, etc) in a bag or purse that you can conceal under your clothing. Use a disposable camera rather than a digital or 35mm. Expensive cameras are popular targets for theft. Do not go out after dark alone. Always hold onto your luggage. Do not wear a lot of jewelry. Having a lot of expensive looking or flashy jewelry makes you an easy target for predators. If possible, it is best to travel with another person or in a group. Wear a wedding ring while you are in Asia. Use a business card for a luggage card instead of using your home address. Never tell anyone that you are traveling alone. If someone persistently asks, lie, if necessary. Avoid hailing a taxi when you are alone. Call a cab company ahead of time to schedule a pick up at your location. When the cab arrives, ask the driver to confirm who he is picking up to make sure they are from the company that you called. Always try to share a cab with a friend or someone you know. Do not engage in personal conversations with the driver. It is okay to be friendly, but do not give out too much information about yourself or your travel plans. When you get to your destination, ask the driver to wait until you are inside. If you ever feel uneasy or threatened, have the driver let you out at a familiar, busy or popular place. Return to Safety Tips for more information.